Petry appeared to take fellow party officials by surprise by announcing at a news conference that, “after long deliberation,” she will not be joining the new party group. She then walked out of the press conference, leaving her colleagues baffled. 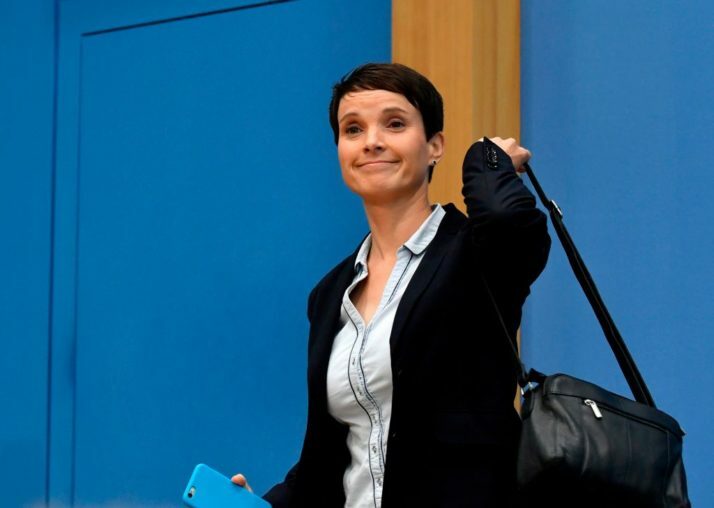 Petry was directly elected to a seat in Saxony on Sunday, where she was responsible for the AfD’s strong showing, winning the largest share of votes. Petry did not run as the party’s lead candidate in the campaign to Sunday’s election due to alleged differences over the party’s direction. Party apparatchiks dismissed Petry’s proposal for the party to adopt a “Realpolitik strategy” at a party conference in April, and chose former Goldman Sachs executive Alice Weidel and former conservative Alexander Gauland as the lead candidates instead. The lack of individuals of stature and vision for Germany, seeking seats, would seem to indicate the general malaise in EUropean Politics, now that countries have foresworn real democracy, in favour of subjugation to a supranational centralised body of un-elected bureacrats and political fat cats & parasites.